Rennet does not go bad! Over time, it will probably loose effectiveness. This means you might have to use a bit more.Rennet needs calcium in order to do it’s job and break the curd from the whey in milk. Calcium is always in milk, but there are a couple of things that will keep the rennet from be able to use it effectively. First, in pasteurized or especially ultra-pasteurized milk, the process is goes through in pasteurization prevents the rennet from being able to use the calcium. So when you add the rennet to the milk in making your cheese, nothing will happen. This is why we suggest you add calcium chloride to your milk as part of your cheesemaking process so that the rennet has plenty of calcium to do it’s work in forming curds and whey. Second, in raw milk there are some conditions within the animal that produces milk that will also block the rennet from being able to use the calcium. Sometimes it’s a higher somatic cell count. This doesn’t necessarily mean the animal has mastitis. Rather it might be happening as the animal gets closer to the end of her milking cycle. So what do you do to keep producing cheese and not waste milk? We suggest you just make a habit of adding calcium chloride to each recipe. This way you will always have a consistent outcome in making cheese. The Calcium Chloride we sell is a very natural product… it is a very concentrated salt type solution with calcium as the main ingredient rather than sodium used in table salt. 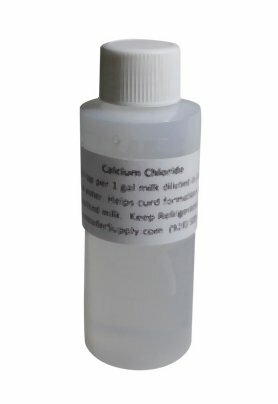 We now add calcium chloride to all of our cheese making kits. – non-GMO, easy to measure, lasts 2 years stored in frig, triple strength needing only tiny amount in your cheese recipe. 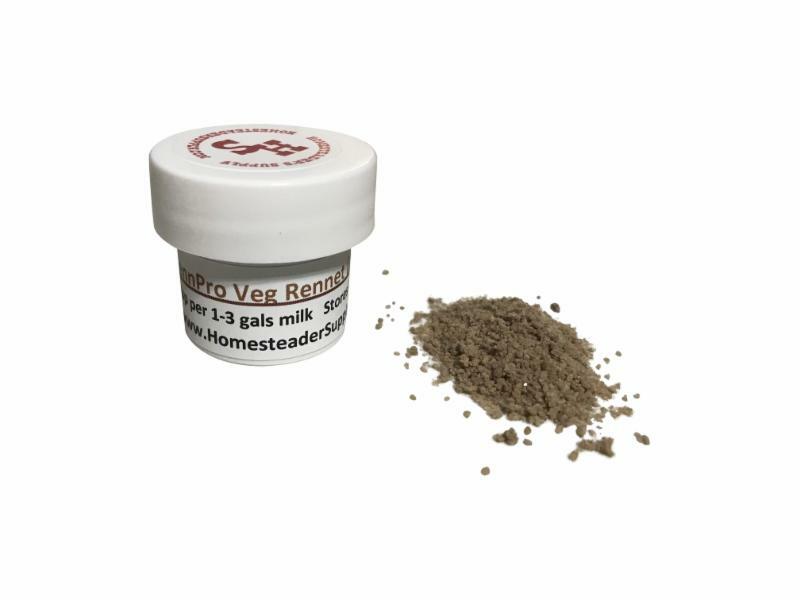 We also carry Vegetarian Rennet Tablets, Liquid Vegetarian Renent, and Liquid Animal Rennet. Our favorite is the RennPro for ease of use, and great price… we have RennPro in all of our cheesemaking kits! Got questions about products or how to use them? Send your questions to us by email. We will answer you right away, but can also post them here so others can learn. This entry was posted in Cheese Making, Q&A, Uncategorized and tagged cheesemaking, curds, making cheese on October 16, 2018 by Homesteader's Supply. Should You Use Calcium Chloride When Making Mozzarella? Lately, online cheesemaking forums have been abuzz with controversy over the question of whether calcium chloride should be used when making mozzarella. Some folks insist that calcium chloride is necessary for proper curd formation, and others argue that it prevents the curds from stretching. To get to the bottom of this controversy, we turned to world-renown cheesemaker Margaret Morris, author of The Cheesemaker’s Manual, 2015 winner of First Prize at the American Cheese Society (ACS) Society, and 2013 winner of the top award at the Global Cheese Making Competition in Somerset, UK. This entry was posted in Cheese Making, How-To, Uncategorized and tagged calcium chloride, cheesemaking, how to, italian mozzarella cheesemaking kit, mozzarella, new products on February 19, 2016 by Homesteader's Supply. The Ultimate Cheese Press and More! Wardee from GNOWFGLINS shows us how to use The Ultimate Cheese Press step by step. It’s very simple and seeing it in action lets us know we’re doing it just right. You’ll find supplies you need to make cheese on our website. Calcium chloride and lipase are here. Cheesecloth and muslin. We have a great variety of cultures. Do you need drying racks, funnels and other cheese making tools? We have two cheese making books. And kits. We have great cheese making kits. And there’s more! You’ll find more cheese making supplies here. 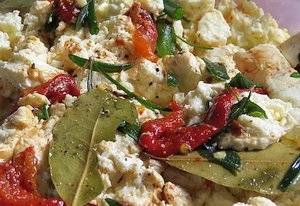 Bay, basil, sage, roasted bell pepper and olive oil makes a delicious marinade. We’re proud of our American made products. Made in the USA, they keep our dollars in not just our country but in our communities. This entry was posted in Uncategorized and tagged cheese, cheese making, cheese press, cheesemaking, recipes on June 30, 2014 by Homesteader's Supply. There’s nothing like homemade cream cheese. You’ll be pleasantly surprised by the difference, especially if you follow this homemade cream cheese recipe. Place cream from milk into quart jar. If you’re using store bought cream you should use one pint. Add 1/16 tsp Mesophilic culture and stir well. Cover the jar and leave on the counter at room temperature for 12 to24 hrs, or until cream is thick just like sour cream, in fact when it is ready, this thicken cream IS sour cream! Place cheesecloth over colander that is sitting inside large bowl or pot. Remove the thick sour cream from the quart jar right into the cheesecloth. Wrap up the cheesecloth and either hang freely to drain the whey and butter milk from the sour cream. The longer is drains the dryer the cheese will be. Allow approx 8 to 12 hours of drying time. 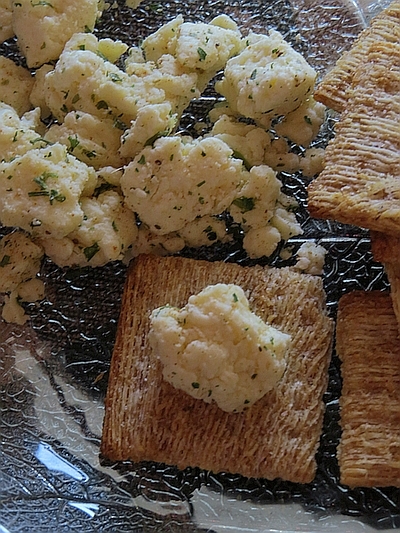 Remove cream cheese from the cheese cloth and add spices, herbs, natural sweeteners to your taste preference. This entry was posted in Cheese Making, Recipes and tagged cheese, cheesemaking, recipe on May 13, 2014 by Homesteader's Supply.